Elias Sayour spent years working toward becoming a pediatric oncologist so he could help kids fight cancer. He always imagined taking care of patients; he didn’t think research was really his thing. But as a fellow in training, Sayour was struck — overwhelmed, really — by two aspects of his work: One was the toxicity of current treatments and the toll they took, with young children suffering the effects of systemic chemotherapy and radiation on their developing brains and surgeries that invariably removed portions of brain tissue along with tumors. The other was that the therapy itself would sometimes kill by causing an infection or other medical issue. Sayour was not sure he could continue on this path. Sayour went on to do his research under Mitchell, whose focus was on developing techniques to fight brain cancer using immunotherapy, or prompting a patient’s own immune system to target malignant tumor cells. 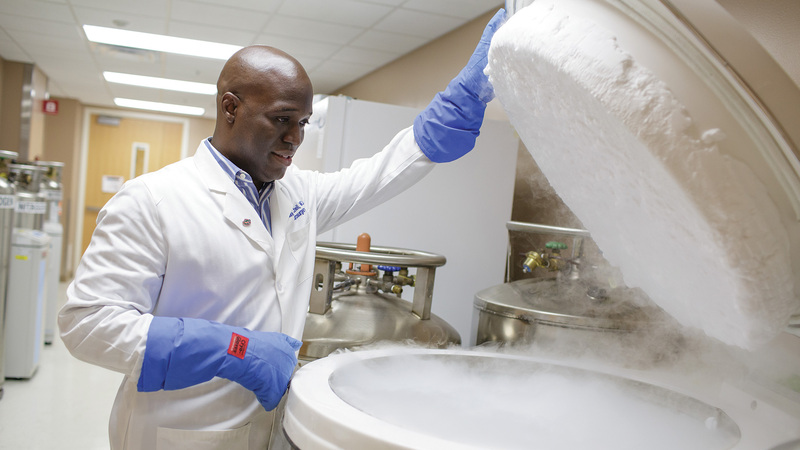 Now, Sayour has joined Mitchell in his burgeoning Brain Tumor Immunotherapy Program at the University of Florida. In just three years since Mitchell moved from Duke to UF, he has built a team that is attracting national attention. This year, Mitchell and his team were recognized nationally for outstanding achievement in clinical research. Glioblastoma is the deadliest brain cancer in adults, with an average survival time of 15 to 18 months. The research conducted at UF and Duke has shown that patients who received an enhanced cancer vaccine had a significant improvement in overall survival length. The resulting paper was named by the Clinical Research Forum as one of the top 10 papers in clinical and translational science in all of U.S. scientific literature in 2015. That accomplishment was the culmination of years and years of work, Mitchell says — lab work, preclinical work, animal models, a first-in-human clinical trial and follow-up care. “Thinking about the number of people who worked together and contributed to that achievement, it was so nice to have it recognized,” he says. His team believes it is only a start. Their program, which is part of the Preston A. Wells Jr. Center for Brain Tumor Therapy at UF (co-directed by Mitchell and neurosurgery Chair William A. Friedman), is now launching a large, phase 2 first-in-human trial to confirm the benefits of the cancer vaccine. With funding from the National Cancer Institute for a five-year study, they will enroll 120 glioblastoma patients in the randomized trial. Moreover, Mitchell’s program is known for its focus on pediatric cancer as well as adult cancer. Mitchell is also leading an immunotherapy trial for children with recurrent medulloblastoma, the most common type of pediatric malignant brain tumor. “When I look at immunotherapy groups across the country, I cannot think of a single one that has as much effort in pediatric brain tumor immunotherapy as this group,” Sayour says. The team of five M.D.s and Ph.D.s in addition to Mitchell — Sayour, Maryam Rahman, Catherine Flores, Jianping Huang and Sridharan Gururangan — came together under — and because of — his leadership. Each of the six scientists is leading specific projects to advance new treatments, under an integrated, coordinated effort involving more than 30 nurses, postdoctoral fellows, graduate students and administrative staff members. 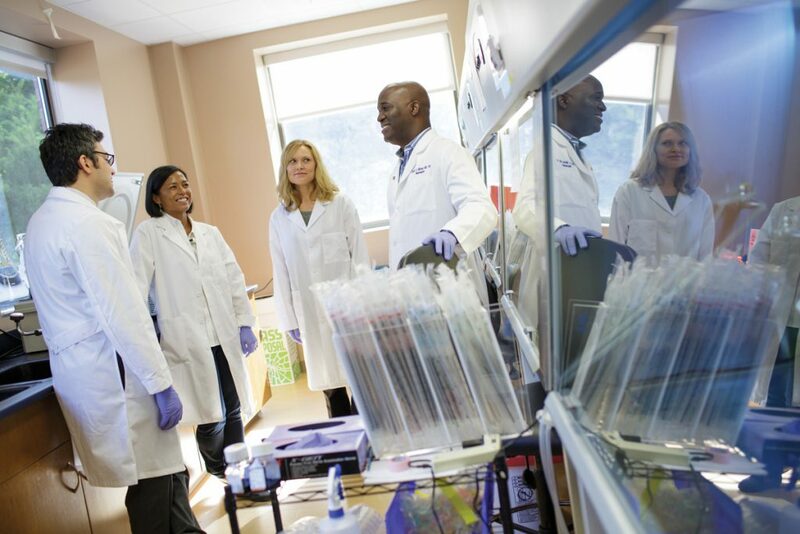 There are three phases to their work: A preclinical research team evaluates new approaches before they’re ready to be tested; a development team works to move treatments out of the lab and navigates Food and Drug Administration requirements; and a clinical research team carries out the clinical trials. The teams span at least nine different departments or divisions in the UF College of Medicine and include 16 additional faculty members. “We work together to make sure that the things we’re advancing within the laboratory setting ultimately have a focus on how we are going to make a difference for patients,” Mitchell says. “One of the distinguishing characteristics of the program here — and a testament to the University of Florida’s capacity and support for the work — is that we are able to take treatments that are literally discovered in the laboratory setting and then bring them to clinical application and make them available for clinical trial evaluation in patients. 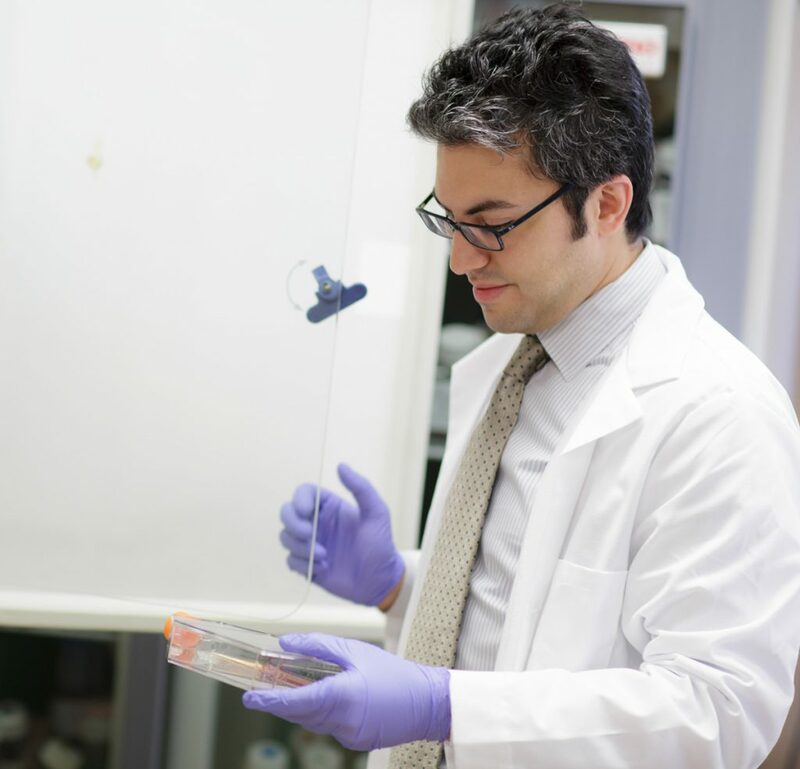 Doing this work has been a long-held dream for Mitchell, whose interest in cancer immunotherapy dates back to when he was an undergrad at Rutgers University. That’s when he first came to understand the concept of a physician-scientist, one who treats as well as develops new treatments, and he was enthralled by the book “The Transformed Cell: Unlocking the Mysteries of Cancer,” by immunotherapy pioneer Steven A. Rosenberg. “I had a picture of what an institution needs to have in place as a vision to really make a significant impact in this field,” Mitchell says. “There has to be an institutional vision and a commitment not just from the scientists, not just the physicians, but the medical school, the hospital and the cancer center. The institution needs to be committed to being a leader and making a difference in this area to be successful. “When I came to visit UF, I saw that those elements were here — all the requisite infrastructure was here to do that, and the commitment and institutional vision to make UF a leader was also here,” he says. Among those he’s recruited in this effort is Huang, who worked under Rosenberg at the National Cancer Institute for seven years and got to witness complete remissions in patients with metastatic melanoma. 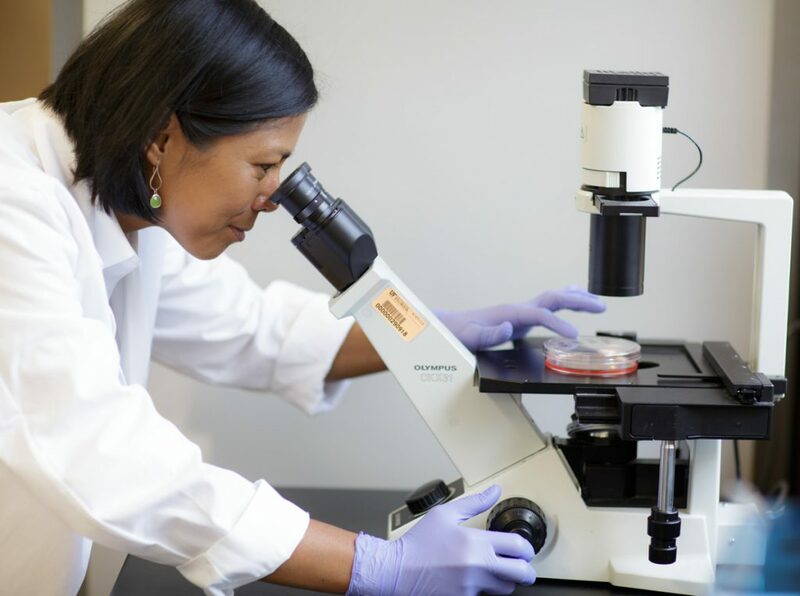 “That really inspired me to work hard on the project,” says Huang, now director of clinical laboratory operations for the UF Brain Tumor Immunotherapy Program, also known as BTIP. Nonetheless, she feels a great sense of hope for the future. Dr. Duane Mitchell discusses the e use of immunotherapy to treat brain cancers and the importance of philanthropy to innovations in treatment options.